Hey lady! You’re here because you know this part of your life is holding you back from being the woman you know you are deep down and she’s waiting to be ignited! You’re excelling in every other area of your life and this is missing piece of the puzzle has been eluding you! For too long you’ve been battling with emotional eating, crazy food cravings, restriction galore and frustration. Something that should be so simple is freaking complicated! Which is why I created this 6 week Intensive program to put an end to emotional eating as you find freedom from food. Dani, i need to hear more! The reason why diets fail and the sabotage continues is because the diet industry is making millions upon millions of dollars focussing on the area that they do, so you keep coming back for more - and this area does not create long term change. Sorry (not sorry) for highlighting this. By only addressing the outcome: food - it does not take into account WHY you turn to food. And the same cycles perpetuate over and over. So here’s why ALL of the work we do is in the deeper part of your mind that holds the secrets to undoing everything that doesn’t serve you as you create healthy habits that do! By the end of the 6 weeks you will no longer be running those deeply engrained habits and the food sabotage will be gone which means you’ll feel calm around food, accept your beautiful body on its journey and have the mind space to focus on the fun stuff life has to offer! IN 6 WEEKS, YOU'LL BECOME THE WOMAN YOU WERE BORN TO BE! We’ll use a process to remove any negative emotions around your motives to emotionally eat. By doing this, we clear the negative charge you used to feel. You know; those times when you’re hot in that heavy emotion, no logic prevails and you end up giving in to your sabotaging cycles. A side effect of this is you’ll feel calmer, centered and more balanced all round! We'll continue the Breakthrough process and focus on simple mindset tips, exercises and strategies to keep you on track as we remove negative emotions and limiting beliefs that have held you back continuously. We replace your old ways with new habits, as the next layer of your future self is revealed. Each fortnight we create mini milestones and every milestone you move through will help bring you closer to what you want. We'll create your next milestone step for the fortnight ahead based on what feels right for you and where the focus needs to be in that very moment. Let's help you connect. You'll receive access to a secret, safe Facebook group where your tribe with be with you, all on their journey, just like you. We're there to support, empower and inspire you, whenever you need it. It’ll become your 2nd home! 6 weekly workbook PDFs uploaded straight to the Facebook Group using journal style questions designed to make you think in a way that you haven’t before. Downloadable onto your laptop with fillable boxes so there’s no need to print them off! Easy, bite sized elements so you're not trying to achieve everything at once! (Because we know what happens there). There’ll be supporting videos and/or audios to guide you as you work through the questions. 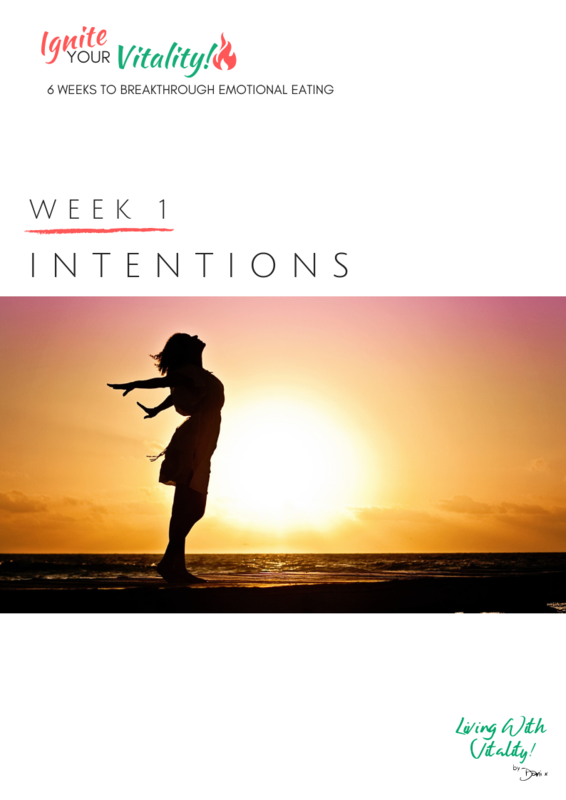 Each week we focus on an element that will empower you to create change in a vital aspect of your life. How? By going deep, creating new habits from the unconscious mind's level that will stop the sabotage - for life! Intentions and much, much more! That's right, over the 6 weeks you have access to me via the Facebook Group - to reach out and ask any question along the way and to help you through a rough patch. This journey is not a linear one, so we help you navigate those times when you need that extra support. By sharing in the group, you’ll find that your problems aren’t so isolated and in fact, your tribe are going through the same things as you! I'm ready for epic change, dani! Imagine how you’ll be feeling when you’ve disconnected the need to turn to food for comfort? Imagine waking up, throwing on the first outfit you find and breezing out the door feeling comfortable in your skin? The next time you’re at the beach or at the pool, you pull on your one piece or bikini and don’t give it a second thought as you’re there to enjoy life and embrace the occasion with all life has to offer? What’s that worth to you? You can’t put a price on that, right? It's time to set myself free! Apply NOW for the next steps to apply for this epic program - only if you 100% MUST stop these cycles and are ready to change your life. MEET SOME AMAZING WOMEN WHO HAVE IGNITED THEIR VITALITY! I AM READY TO IGNITE MY VITALITY!